Please follow these instructions to amend your personal details on the England Athletics website. Another fantastic turnout for the club not only with the runners but it was well supported by Marshals who always feature in the background but are hugely appreciated. Well done to everyone. The Granite Way races after having to be postponed due to the snow three weeks ago, the races finally went ahead last weekend in near perfect conditions with sunshine and just a slight breeze. There are two distance options here, a 10 mile and a 20 mile, both starting and finishing at Okehampton Youth Hostel and following the Granite Way to beyond Sourton Church where they turn and head back, this being repeated a second time by the 20 milers. On such a beautiful spring day the views of the moors and open countryside made for some distraction from repeating the same route twice for those doing the longer run, which is often used by runners training for spring marathons as one of their last long runs, being fully supported with drinks stations and with a race atmosphere. Both races however are hotly contested by most of the runners, even those declaring it was just a training run! Our club had runners in both races with five taking on the 20 miler and seven doing the ten mile race which set off half an hour later to avoid congestion. The fast 10 milers however soon caught up with those having to pace for a longer distance, with Rob Kelly leading the way on the outward journey. In a very fast and close finishing race Rob was first home for the club eventually finishing third in 1:00:30, just seconds behind the second placed runner. This gave Rob his final diamond award and fulfilling his aim to achieve diamond awards at every distance this year. Andy Vernon was the next club runner home, coming fifth in 1.06.50 with Mike Baker, who entered after the disappointment of the “Grizzly” being cancelled, finishing well in 1.14.31. Tom Andrew ran a good time of 1.20.00 with Mike Westland not far behind with another good race to come home in 1.23.20, with Karen King, running her second race for the club, chasing him home in 1.23.40. Geraldine Walter and Jo Bradford ran together and were pleased to finish in 1.29.49 as Jo has been unwell and only got back to running a week ago. 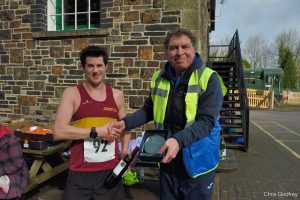 In the 20 miler, won by Tavistock’s Adam Holland for the second year in succession, all the ORCs taking part were training for marathons, with Andrew Thorne the first of the five home, finishing in 2.43 33. Jackie Dawes was lucky enough to win the one club place for the London Marathon and is training hard to make the most of the opportunity and do herself and the club proud. This is the second time she will have done London and the second time she has run this race in preparation, coming home 16 minutes faster than previously to give herself a new PB of 2.57.30. Gareth Williams is running the Manchester Marathon in two weeks time and was happy to finish in 3.31.30, with Kathryn Volkelt-Igoe next in 3.37.40 to set herself on course for London and Deborah Cunningham in 3.42.00 aiming for the Great Well Marathon. Liam Keen was the only Okehampton member running a different race on Sunday, taking on his first half marathon in Yeovil. This race starts in the town centre before heading along the entire length of Yeovil Country Park. The route then leaves the town on the western side to Montacute House, before returning on quiet country roads to a big town centre finish. Liam ran well to finish in 2.12.32. We are pleased to announce that Okehampton Running Club is moving to The Pavilion in the Park (The Hub) in Simmons Park from 1st May. The Hub will be available to the club from 18:00 on Tuesdays and Thursdays with runs departing from 18:30 to finish around 19:30 as usual. There will be an area to lock belongings when out on the run. On a weekend that should have been full of racing for Okehampton Running Club members, the mini ‘Beast from The East’ blew in and caused disruption to races scheduled for Sunday. While the calendar tells us it is the middle of March, the weather seems stuck in mid-January and despite organiser’s leaving decisions on cancellations until the last minute, most fixtures were abandoned in the end. Without these races to take part in most runners resorted to doing some local miles to keep up the training, but a few ORCs actually managed to race on Saturday morning before the snow set in. Rob Kelly took part in the 5kool 5k in Tavistock, which is a monthly race that starts and finishes with a circuit of the athletics track, with the runners going out to the Meadows and back in between. Record numbers took part in this month’s run with all proceeds going to Sport Relief. Rob had a great run, finishing in under 18minutes for the first time to set a new PB of 17.40, and taking third place. Geoff Hill and Gill Spinney also slotted in a race at the Tamar Lakes parkrun on Saturday morning, where, despite neither of them running their best times they came in first male and first lady. Team ORC were out in strength on Sunday at the Bideford Half Marathon. Always a hugely popular early season race over a fast and flattish course, it gives runners an opportunity to test how their training is going for later races. Starting by the Blue’s clubhouse on the Quay, after a short loop round the streets, the runners follow the undulating main road to the Puffing Billy in Torrington before returning to Bideford via the Tarka Trail. Conditions were pretty good with a brief shower during the race and the Tarka Trail providing shelter from the blustery wind. First home for the club in a terrific time of 1.22.01 was Paul Carter, winning the 1st MV50 category and a bottle of bubbly on his birthday, beating training partner Roger Voaden who came home in 1.23.54. Roger took third MV50, both of them securing platinum club awards and showing their London Marathon training is on target. New member Hayden Bond was next with a stunning time of 1.35.53 in his first half marathon and having only taken up running in the past few months, showing there is more to come from this young man. First home for the club ladies were the incredible Marvin duo of mum Sarah and daughter Molly. Having recovered sufficiently from representing Devon at the cross-country Championships the day before, Molly ran her first half marathon here. After a long day’s travelling to Loughborough and back, they ran together to finish in identical times of 1.46.53, Sarah setting a new club age group record. Mike Westland loves this course and always runs well here coming home in 1.49.59 followed by Karen King running her first half marathon for many years after a long break from running while bringing up a family and pleased to have paced it well and finished strong in 1.52.36. She had run some of the way with Jane Jackson who has finally put her health problems behind her and, despite only aiming to complete the race, ran well to finish in 1.53.53, coming 3rd FV60 and securing her platinum club award. Jo Turner was just a few seconds behind Jane, having run the tough 14 mile Deep River race the day before and barely having done any road running in recent months while concentrating on training for her upcoming Ultra. Jane Jones was pleased with her time of 1.54.27, but would have been home sooner had she not suffered a crippling attack of cramp in the last mile. Pb’s were run by Jo Burrow who knocked a huge 7 minutes off her previous record to finish in 2.08.56, Geralidine Walter, another one to have not run a half for fourteen years with a great run just over the two hours in 2.01.33 and Vicky Hall improving by over 2 minutes with her time of 2.12.58. Other ORC times; Abi Colton; 1.58.42, Tom Andrew; 1.59.22, Chris Fullford-Brown; 2.01.58, Gaz Williams; 2.04.30, Tracey Mills; 2.05.27, Rachael Haydon; 2.12.58, Chris Turner; 2.26.06 and Jane Richardson; 2.31.29. Young Molly Marvin had started the cross-country season late, thinking she wouldn’t fit it in with other commitments but, after running the Newquay leg of the Westward League series, she was so disappointed with her time she couldn’t resist the challenge of improving. Such was her improvement she qualified to represent Devon at the national Inter-counties Championships which meant a trip up to Loughborough on Saturday for her and her family. 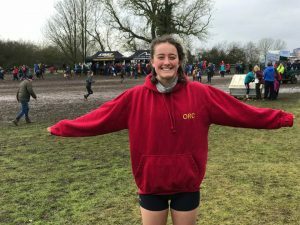 Having experienced the mud-bath conditions at the Plymouth meeting, Molly coped very well when faced with even worse mud here, even managing to enjoy her run and finishing in the top 200 in the country. So bad was the mud, Molly had to be hosed down before making the return journey home! 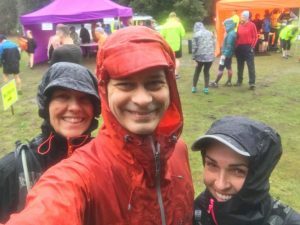 At the Deep River Races on Saturday, Jo Turner and Ali Holiday continued their quest to do some off-road races in preparation for their upcoming four day Ultra. There are two distance options at these races organised by PureTrail Running, a 10k and a Half Marathon which is in fact 14 miles. Using tracks in the Woodland Trust’s Fingle Woods the runners start from near Castle Drogo with both distances crossing the River Teign via the iron footbridge to run to Fingle Bridge along the riverbank. Here the 10k runners cross over and follow the path along the opposite bank to return to the starting point while the longer race takes runners along hilly woodland paths and tracks, including twice visiting the highest point in the woods. The conditions weren’t great with rain and plenty of mud following the snow-melt. Two other Okehampton runners took on this tough course with Stephen Gentle having a fantastic run to finish fifth overall in a very impressive 1.50.19 and Stuart Page coming home in 2.43.34. Jo and Ali were happy to finish in 3.18.39, as this was a training run more than a race and with Jo having the Bideford Half Marathon to run the next day. 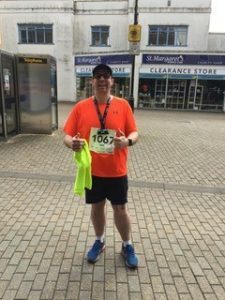 Jo’s husband Phil Turner took the shorter race option and completed the 10k in 1.12.19. With the “Best from the East” blowing in with its arctic winds and heavy snow, nearly all the racing fixtures for this weekend were cancelled or postponed. The one exception to this was the final round of the Westward League series held in Redruth on Sunday. Being the deciding round where points could make big changes in the final standings, it was important that it go ahead if at all possible, so the decision to proceed was only made Saturday afternoon when there had been enough of a thaw. 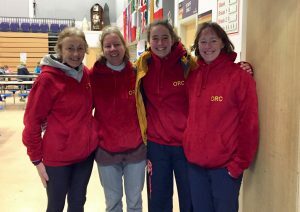 Okehampton was well placed in the standings with individuals and teams, but it had become clear that attendance at the last competition was necessary to maintain those places, so a full ladies team and two men made the long trip down the A30 to do their best. Conditions were typical with plenty of mud and the ladies race was blessed with sunshine but a cold wind. First home for the ladies was the reliable Molly Marvin, pulling ahead of her mum Sarah in the last lap. Sarah too had a great run though and was very pleased to find that her efforts here had been worthwhile when she finished third in her age group. Anne Binns had a better run than at the previous round in Plymouth to come in next but unfortunately Jane Jackson had to retire feeling unwell after one lap. In the men’s race Paul Crease knew he had to throw everything into this run as he had some fast runners coming to do their fifth race to count here and threatening his position in his age group. Halfway through their race the heavens opened depositing an unpleasant mix of hail and rain, but Paul continued to run an impressive and gutsy race which finally saw him also come a very creditable third in his age group. Andy Humberstone was the only other ORC male to run and was pleased to have completed at all six of the fixtures in his first time running the League and finishing ninth in his age category. Individuals well placed were Molly Marvin; 5th, Jane Jackson; 5th, Paul Carter; 5th, Anne Binns; 6th, Gill Spinney; 9th. Congratulations to all the runners who have turned out to represent the club at these tough, competitive races. Error: Error validating access token: Session has expired on Saturday, 20-Apr-19 03:20:42 PDT. The current time is Monday, 22-Apr-19 11:04:12 PDT.